Season’s Readings! Our gift to you: Every day in December, leave a comment and your email address for a chance to win a book by the author of the day. Today's winner will get a signed copy of DEATH AL DENTE! Another holiday season come and not quite gone. The Village is so beautiful, all lit up for Christmas. Some of our visitors can’t imagine how a little bitty town gets so much done – especially since it isn’t actually a town with a mayor and council, city works departments, and all that. Honestly, I think we get more done because we’re all volunteers – and because we’ve been doing this so long. Then on Decorating Day, a Saturday in late November, all the elves gather, wearing our Santa hats, and transform the Village into Wonderland. The power company donates cranes to lift the garlands into place on Village rooftops, and elves bustle up and down the streets, putting up trees and twisting on bows. Other elves distribute coffee—with a touch of schnapps or Bailey’s for those who like a little something extra. And the big tree—donated by a local forester---goes up right in front of my shop. That evening, the Village Merchants open their shops and galleries for an Art Walk, and at seven, we light the tree and sing carols. Oh, what fun it is to see a town transformed! One more reason we all love Jewel Bay! 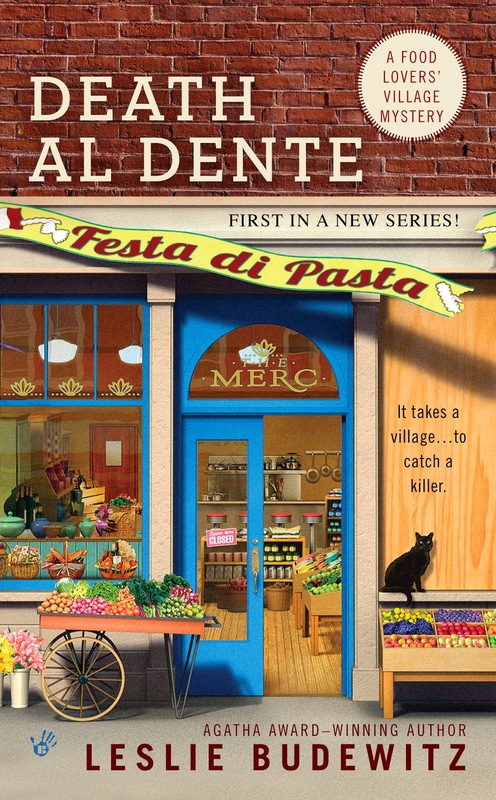 DEATH AL DENTE is the first book in the Food Lovers' Village Mysteries, published by Berkley Prime Crime in August 2013. The series is set in a small, lakeside resort community in Northwest Montana, on the road to Glacier Park. Guess where my author, Leslie Budewitz, lives! Watch for CRIME RIB, coming in July 2014. Contest entrants will also receive a subscription to Leslie's electronic newsletter. Photos courtesy of Bigfork Area Chamber of Commerce. I love getting in on the first novel in a series! Thanks! this sounds like a great series, with a different setting. I love Glacier! I lways enjoy finding a new series to read. a definite add to my WishList!! I liked your first and am looking forward to the second. This sounds like a really great book and I know it will be a series I will love. Cannot wait to read it. Thank you for your generous giveaway. I’ve had more fun “haunting” this site every day because I’m finding lots of delightful books to add to my Wish List. Volunteers can work wonders! Wonderful setting. Looking forward to your series. Thanks so much! Remember to leave your email address so I can contact the winner! And if you want to get in on the fun in Jewel Bay, UNdecorating Day is coming up! I love when whole towns decorate! The festive atmosphere makes everything better. Sounds great, love that area of the country. I just loved reading about all of these small towns! Thanks for this month - a fun blog to read every day, many new series to add to my TBR list (started already!) and the giveaways such a nice bonus. This sounds like a fun series, and I love the prep for Christmas. I also love this time after Christmas. No matter how hectic the rush to get there has been, this is the time to just savor the moment. Can't wait until this is available! Volunteers are the 'hearts' of every community!! What a lovely gift all you readers are giving the writers of Killer Characters: the joy of knowing you enjoy the stories we tell and the places we take you! Sounds like a good series, I will put it on my list. Our little town is a tourist town and it gets all lit up, too. It's just beautiful during the holiday season. Can't wait to read this series. Your titles are so fun! It does sound like fun. I always love Christmas lights. How lovely to hear from you all! City lights are great fun, but yes, Sue and Linda, small towns really shine when it comes to Christmas spirit! Corduroy7, DEATH AL DENTE is available now. It came out last August. The second in the series, CRIME RIB, will be out July 1. And you should see how Jewel Bay celebrates the Fourth of July! This sounds like a wonderful series! I can't wait to read it! I imagine a lot of small towns are sort of like that. The book sounds great and to start at the beginning of a series would be fun. This series sounds wonderful! Definitely going on my TBR list. Looks like great cozy mystery. Thanks for giveaway. I love looking at Christmas lights around town with my family! I adore towns that decorate! Our small neighborhood has a group of neighbors that tie red bows on all the old street lamps, and on Christmas Eve all the houses set out luminaries.....of course all the houses are lit too!! Looks like a fun read!